Now that Lent Madness is well underway, brackets are getting busted left and right. Mechtild of Magdeburg easily knocked Isaac the Syrian out of the running (77% to 23%) in yesterday’s battle, the only Saturday contest of the season. Come back tomorrow, as the week starts off with John Wycliffe vs. Moses the Black at eight o’clock in the morning, sharp. Of course, we at Lent Madness HQ hope that you have adopted a Lenten devotion beyond the madness. There are many ways to make good use of this Lenten season of repentance and renewal. You might cultivate habits of daily prayer or study. You might be more intentional about serving the poor or sharing of your abundance with those in great need. Obviously, if you’re playing Lent Madness, you haven’t given up the internet, and we don’t suggest that (but if that’s what you need, go for it!). If you’re looking for some help to get through Lent, there is still lots of time. Forward Movement, the official sponsor of Lent Madness has loads of resources to help you on the journey. New this year, Ashes and the Phoenix brings together daily meditations, powerful poetry by Len Freeman, and Jason Sierra’s inspiring woodcut art on your Kindle, Nook, or iBook device. If you are looking for a resource focused on mission outreach and social justice, check out Meeting Jesus on the Margins (Kindle, Nook, or iBook), featuring meditations from Becca Stevens, Mike Kinman, and our own Hugo Olaiz, among other excellent writers. And, of course, we would be remiss if we didn’t mention Forward Day by Day. This venerable daily devotional is ready by hundreds of thousands of people around the world every day. You can read it online, find it on Facebook or Twitter, subscribe to print, or get it delivered to your email inbox. There’s also a podcast. Whatever you do, we encourage you to take on a spiritual discipline for the season. If you’ve already done that, terrific. If not, you’re not alone and it’s not too late. In fact, it’s never too late with God. Isn’t that great news? Grace abounds! Speaking of abounding, competition abounds too, so get a good night’s rest so you’re ready for the big day tomorrow as the first full week of Lent Madness 2017 kicks off. Happy Lent! 8 Comments to "There’s more to Lent than madness"
Thank you for the reading suggestions. That is something I’ve been looking for. I wish you would give a pronunciation guide for names of the saintly contenders. Some of them, like the upcoming John Wesley, are a snap, but some of the others are devilish to figure out. It’s hard to brag about my choice if I’m afraid I’m not pronouncing the name correctly. Just a thought… This is my second year playing, and loving it. Thanks for all the amazing Lenten resources. You bring encouragement to the discouraged. Ashes and the Phoenix is a treasure. I actually purchased that with the 10 copies of the Madness line-up. We play the Madness game mornings and contemplate with the Phoenix evenings. 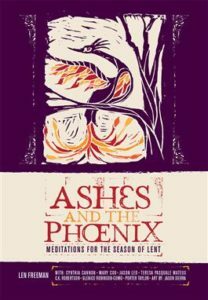 I am using the book Ashes and the Phoenix for personal devotion this Lent. It has been “just what the doctor ordered”! I have also found it to be a blessing to spend time meditating on the saints of the day in the Lent Madness bracket. Aside from the joy aspects of the messages from the celebrity bloggers and the comments, it is inspiring to contemplate the examples set by the saints. Bless them and bless you all for this holy Lent. Excellent reading suggestions, thank you.